Constructed with a solid metal handle that is chrome plated. 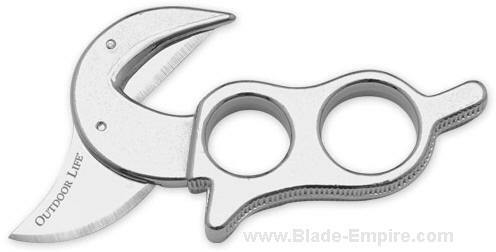 The 420 stainless steel blade is interchangeable. Includes nylon reinforced sheath and two interchangeable blades (1 razor & 1 serrated) and two small screwdrivers used to change the blades. Clam Packed. 1-1/2" blade, 4-3/8" overall.